When you’re ready to get started, you can sign up for an account on LinkedIn. There are two important areas on your LinkedIn home page that you’ll use a lot: the top navigation bar and the Accounts and Settings page. Home: Link to your personal LinkedIn home page. Profile: Links to the profile part of LinkedIn. Network: Links to view your connections on LinkedIn or add/import new connections. Jobs: Links to the different job searches and postings you can do on LinkedIn. Interests: Links to search LinkedIn Company pages or keep track of companies you can follow using LinkedIn, as well as links to LinkedIn Groups, individual people known as LinkedIn Influencers, or LinkedIn Education (which includes schools and students on LinkedIn). Business Services: Links to post a job on LinkedIn, use the Talent Solutions section of LinkedIn, or create a LinkedIn ad to run on the site. When you hover your mouse next to any of these words, you can see the various options in each section. If you simply click the word, like Profile or Jobs, you’re taken to the main page for that section. You can also click the Advanced link to the right of the Search box, above the top navigation bar, to bring up an Advanced People search, or you can click the drop-down list before the Search box to search for Jobs, Companies, or Groups from any page on the site. If you already changed the search criteria to another function, like Jobs, Companies, or Groups, clicking the Advanced link brings up the appropriate search page. Inbox: The picture of an envelope opens up the LinkedIn Inbox, where you can see incoming messages and invitations. Notifications: The flag icon indicates new actions you should be aware of when using LinkedIn, like when you are mentioned, receive an endorsement or recommendation, or have a new connection. Add Connections: The picture of the + with a person is a quick link to bring up the tools to add more connections to your LinkedIn network. Account & Settings: After you add a profile picture, this is a thumbnail of your profile photo, and clicking this button expands a list of options that allow you to check your settings, check your job posting or Company page (if applicable), and reach the LinkedIn Help Center. 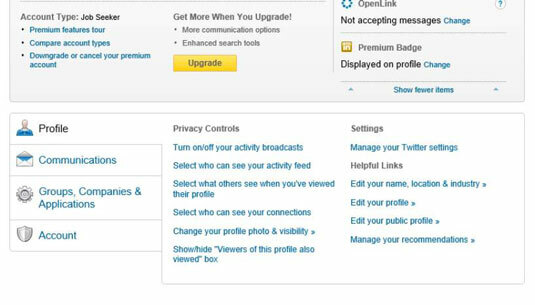 If you need to update any aspect of your LinkedIn account, go to the Account & Settings page. You can always find a link to this page at the top right of any page within LinkedIn by hovering your mouse over the Account & Settings button, and then clicking the Review link next to the Privacy & Settings header. At the Account & Settings page, you first see the settings for your particular account level, especially if you have a premium account. Scroll down to see all the different settings you can update for your LinkedIn account. Profile: Set how much of your profile is accessible by your contacts, and also how much information you want to make available to your network in terms of profile or status updates. Update any part of your profile, add a profile photo, change your status and public profile settings, and manage your recommendations. Communications: Set the frequency of e-mails from LinkedIn, as well as who from LinkedIn’s partners can reach you. Select how other LinkedIn members can communicate with you and who can send you invitations. Groups, Companies & Applications: Update settings for your memberships with different LinkedIn Groups, view companies that you’re following, and view or add applications that you’re using with LinkedIn. Account: Update privacy settings, e-mail addresses and password on file, language and security settings, and links to upgrade, downgrade, or cancel your LinkedIn account. 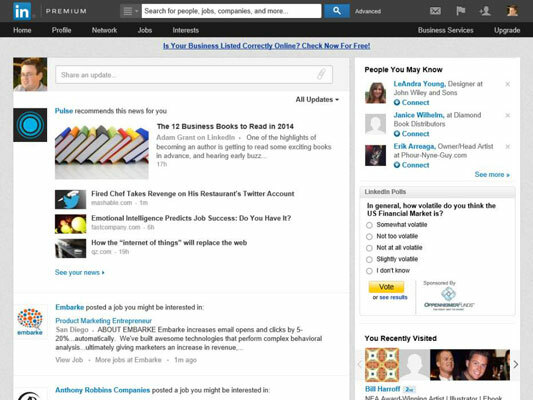 You can also enable an RSS feed of your LinkedIn account from a link in this category.